In a Europe, where we are increasingly witnessing barriers to access fundamental rights and civic actors are being stigmatised, oppressed or even criminalised. On 10 December 2018, as the world celebrates the 70th anniversary of the Universal Declaration of Human Rights, hundreds of civil society organisations (CSOs) and movements mobilise across European countries. They share the same vision for making Europe a place where the access to fundamental rights is a reality for all and they call for more recognition and support for their action at local, national and European level. 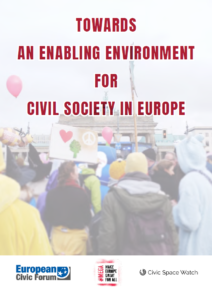 This paper provides recommendations to European policy-makers towards creating an enabling environment for civil society all over Europe. The recommendations are based on the analysis of the challenges perceived by our members and on the evidence collected through the platform Civic Space Watch, the CIVICUS Monitor and the report on civic space in 2017 by Civil Society Europe. The trends observed across these monitoring tools are confirmed by the European Union Agency for Fundamental Rights (FRA) report on Challenges facing civil society organisations working on human rights in the EU (2017).